Putting often claims as many as half of a golfer's total strokes. When golfers tally their scores at the end of a round, most of them find that putts make up about half of their stroke total. But ask the same golfers if they practice putting as much as they practice other parts of their game and the likely answer is "No." Indeed, most golfers spend lots of time on the driving range hitting their irons and drivers, but relatively few spend much time on the practice green. Here are some tips for practicing your putting. Practice the routine. Some golfers take three practice swings. Others remove their glove just before they putt. Whatever the routine used before putting, the same routine should be incorporated into practice. Routine breeds comfort, which translates into successful putts during a real round. Practice with only two balls. The balls should be the same so that each putt is the same. Golfers who practice putting with more than a couple of balls tend to move too quickly. They hit one ball and immediately move on to the next, and so on, without taking the time to think about how an individual putt felt or why it went where it did. 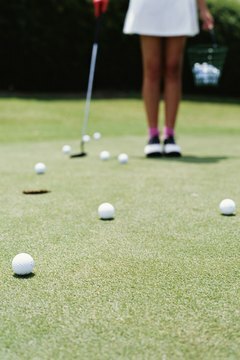 In addition, golfers should sink each putt during practice – even if it takes two or more putts. That is hard to do if you have too many balls running into one another. Practice like it is real. When golfers hit their ball onto the green, the average distance between their ball and the hole is between about 20 and 30 feet. The average chip lands three to eight feet from the cup. As a result, golfers should focus most of their practice on long putts – those between eight and 30 feet – and short putts from eight feet in. Practicing long putts helps golfers develop distance and speed control, too. The goal should be to make every putt, but the reality is that golfers miss most of their long putts. So their secondary goal should be to get the ball within three feet of the cup. Spend time practicing those short-distance putts to make sure you do not add unnecessary strokes to your total. Work downhill. A downhill putt is one of the most difficult putts that golfers encounter. Golfers have a hard time judging how fast the ball will go, especially as they try to factor in the velocity the ball will gain as it rolls. As a result, golfers should practice downhill putts. A good tip for downhill putts is to hit the ball on the toe of the putter, which deadens the impact of the putter on the ball and helps control speed. Practice putting on the toe of the putter to get a feel for how those types of putts will feel. Stay at it. Given that so much of a golf score is made up of putts, it is important – especially for beginners – to practice putting as much as they practice the other elements of their game. Experienced golfers can get away with practicing less – perhaps twice a week for 60 minutes each time – but still will benefit from any additional practice.